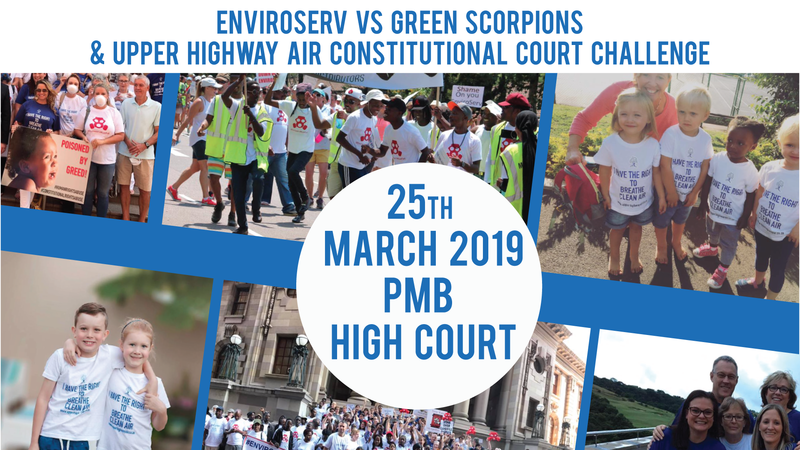 Today, 3rd April 2017, Upper Highway Air NPC, acting in its own interest, in the public interest and in the interests of protecting the environment, instituted action against, amongst others, EnviroServ Waste Management (Pty) Ltd, D Thompson and E Gombault, arising from the alleged breaches by EnviroServ of the conditions of its waste management licenses, statutory and regulatory provisions applicable to the conduct of its waste management operations at Shongweni, the infringement of members’ of the public’s Constitutional right to an environment that is not harmful to their health or well-being, and the common law duty of care owed to members of the public not to negatively impact upon them or pollute the environment. The Ministers of Environmental Affairs, Water and Sanitation as well as other provincial and local functionaries have been cited as interested parties, although no relief is sought against them. This in no way detracts from the DEA’s enforcement procedures regarding, amongst other things, the process underway in which a decision is yet to be made as to whether EnviroServ’s waste management license will be suspended or revoked. We look forward to the DEA’s decision in this regard. The relief sought by Upper Highway Air in the action, is for the interdict of the operations in the event that the DEA has not already suspended/revoked EnviroServ’s license by the time the matter reaches trial, an order directing EnviroServ to comply with its license conditions and statutory obligations which the NPC alleges have been breached, for EnviroServ to account for the advantages it has received by virtue of the contraventions, and for an order declaring it not to be a fit and proper person in so far as any license application, renewal or review of existing licenses are concerned in relation to the Shongweni Landfill Site. What’s that Smell? Golf Day Fundraiser in support of Upper Highway Air.